Delivery is usually the next day or when it fits your schedule. You can request a delivery time and date on the delivery form as you complete your rental. Where can I put equipment? The equipment can go anywhere that the size of the equipment allows it to go. However, we do require that the equipment be installed in a climate controlled area. No outside patios, non air conditioned garages, etc. The equipment will be professionally assembled and delivered to proper operating specifications. Whats RDI (Required Delivery Information)? The Required Delivery Information questions are evaluated to determine if you are able to accept delivery of the equipment that you requested. Can I swap out equipment? Yes. For an additional delivery charge, we will deliver a new machine and remove the current rental machine. The recurring rental price is subject to change to reflect the different rental pricing for the new machine. Can I buy the equipment? An Early Termination Fee will be charged should the rental contract be ended early. The customer may pay the remainder of the contract value to complete the rental contract and avoid the Early Termination Fee. Upon completion of the rental contract, you may contact us to schedule the pick up of the equipment. If termination of the rental is not requested, the rental contract automatically continues on a monthly basis until the customer chooses to end the rental and request equipment pick up. During the post-contract completion period, the early termination penalties no longer apply. All service and repair issues will be dispatched by us and performed at your convenience by trained and qualified service technicians in your area. Some machines require a periodic maintenance. This is much like routine service (oil change, etc.) on an automobile. For long term rental contracts, all scheduled maintenance will be dispatched by us and performed at your convenience by trained and qualified service technicians in your area. FitDel exclusively rents commercial and light-commercial fitness equipment. In laymen's terms this equipment is the same high quality, heavy duty equipment you would expect to see in gyms, hotels and home owners associations. Our equipment feels rock solid and operates smoothly, unlike the residential level equipment you'll find at sporting goods stores. 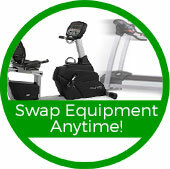 We firmly believe that high quality equipment provides better and more enjoyable workouts. And the more you enjoy your workouts the more you'll do it and the better you'll feel. We understand ordering online can be scary. It scares us sometimes too. However, we want you to feel completely comfortable with renting from FitDel. We believe in concierge service and we believe in doing the right thing. IF for any reason, during the first 30 days, you are unhappy with the fitness equipment you picked we will swap it out for something else (no delivery fee) OR we will take it back (No Early Termination Fees, No Pickup Fees). While stress burns calories, it's a whole lot better to do it working out on equipment you love! We're dedicated to making your home gym stress free. You DO NOT have to move anything yourself. You DO NOT have to assemble anything yourself. Our experienced technicians take care of everything. 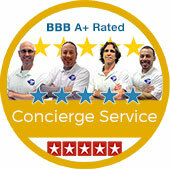 We believe in Concierge Service and our 5-Star ratings on Google, BBB, Yelp and Facebook back up that claim. Just let us know where you want it and we'll take care of everything else. As stated above, typical delivery and installation is $75. Delivery is cheaper for lighter equipment such as spin bikes, rowers, and as you'd expect, it's higher for heavy equipment such as treadmills and full gym packages. We keep delivery charges as low as possible. Exactly what it says. Your monthly rental is all you pay. There are NO additional fees for service calls or maintenance. IF anything goes wrong with your equipment, we will swap it out our repair it at your location. We pride ourselves on concierge service and taking care of our clients! In the unlikely event that there is an issue with your equipment, we will get it fixed as soon as possible. Our goal is to have you back to working out the next day. We DO NOT want you getting stuck with a machine you've gotten bored with. We want you working out and enjoying fitness. IF you decide you want to swap out an elliptical for A treadmill - Do It! If you want to swap out a Treadmill for a spin bike -Do It! All you pay for is the delivery on the new equipment. Your contract will still be the same length. It Does Not reset. We rent equipment to because we hate seeing people from turning expensive fitness equipment into clothes racks. People get bored, that's just the way it is. So "Keep It Fresh" with FitDel and always look forward to your workout. For the last 5 years we've exclusively received 5-Star ratings on Google, Yelp, Facebook and the BBB. We also have an A+ rating on the BBB. Check out our rave reviews here. If that sounds like we're bragging... yep, guilty as charged! We take serious pride in providing the best customer service you've ever received - anywhere! We want to hear this from Everyone we take care of. "I cannot say enough about this place! Fast, efficient true customer service. No haggling just good ol fashioned do what's right the first time for the customer." Norma Z. We've taken care of A-list celebrities and we firmly believe that's the same service we should provide to everyone.